A kayaking adventure near an iceberg in Hare Bay in Newfoundland, Canada. A kayaking adventure in Hare Bay, Newfoundland in Canada takes this man near a massive iceberg which requires extra caution. This huge white giant floats along the coast of Newfoundland for tourists to have a closer look. North America, Canada, Newfoundland, Northern Peninsula, Hare Bay, Iceberg, Kayaking. 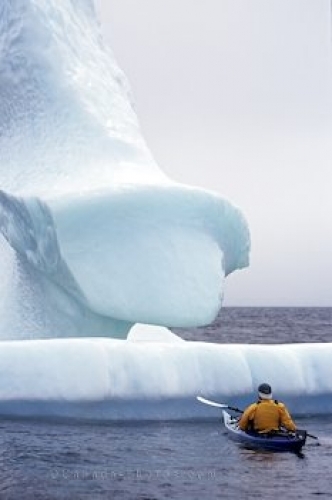 Picture of a man kayaking near an iceberg in Hare Bay, Newfoundland, Canada.